is a Franco-Italo-German cult film, created by Claude Zidi, and released by 1999. The sequel, Asterix & Obelix: Mission Cleopatra, was filmed in 2002. At the time of its realise it was the most expensive production in French Cinema of all time, making it the most expensive production in France for the 20th Century. It was only removed from the "Podium" by its Sequel. 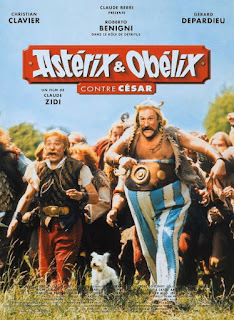 The film combines elements of the plots of several mostly early Asterix stories, most from Asterix the Gaul (Getafix's abduction), Asterix and the Soothsayer, Asterix and the Goths (the Druid conference), Asterix the Legionary (Obelix becoming smitten with Panacea) and Asterix the Gladiator (the characters fighting in the circus). Jokes and references from many other albums abound, including a humorous exchange between Caesar and Brutus taken from Asterix and Cleopatra.